Norwegian Cruise Line, the innovator in cruising, today announced the completion of the refurbishment of Norwegian Jewel as part of The Norwegian Edge® program, reaffirming the company’s commitment to elevating the standard of excellence across the fleet. Following a two-week dry dock in Singapore for the company’s most extensive enhancement project in 2018, Norwegian Jewel will debut in Sydney, Australia on Saturday, Dec. 1, showcasing refreshed venues, updated spaces, premiere entertainment and redesigned staterooms. 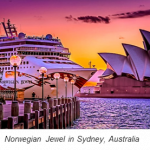 Offering seven to 19-day itineraries to some of the region’s most exotic destinations, she’ll spend her winter 2018 and spring 2019 seasons cruising from Sydney, Hong Kong and Singapore, before joining Norwegian Bliss and Norwegian Joy in Alaska for the summer. Norwegian Jewel will feature two new shows – “Rock You Tonight,” and ship exclusive “Velvet,” illustrating the company’s commitment to providing high-caliber entertainment. “Rock You Tonight” showcases a medley of songs from the best bands of the 70s, including Queen, Journey and The Who. The Australian hit musical “Velvet” makes its debut at sea with disco classics, a stellar combination of circus acrobatics, cabaret and burlesque elements, and features the talented Brenda Edwards of “X Factor UK” as the lead, with “The Voice” finalist, Frenchie Davis to follow. 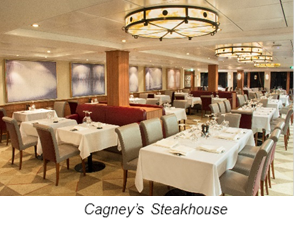 Nearly all dining, bar and lounge offerings on Norwegian Jewel were updated, and two new venues were opened – The Pit Stop and Bliss Ultra Lounge, replacing the Sky High Bar and FYZZ Cabaret Lounge. Drawing inspiration from the 1950’s, The Pit Stop is an all-American bar retrofitted with vintage license plates, gas station signage and other classic car elements of the era. Bliss Ultra Lounge offers late-night entertainment in a modern and upscale setting, with more intimate seating options now available. All 1,188 staterooms were upgraded with new televisions and USB outlets, as well as new carpet, artwork and furniture. The Haven by Norwegian® received updates to the courtyard, additional cabanas on the sun deck and new finishes, carpets, tiles, drapes, artwork and furniture for all suites and villas. The ship also boasts two new Haven Deluxe Owner’s Suites, at nearly 1,200 square feet and featuring large, 567-square-foot balconies, two private jacuzzies and accommodates up to four guests. As the heart of the ship, the Atrium has been revitalized with an entirely refreshed look centered around a custom-design chandelier and includes updated flooring, refurbished reception and shore excursion desk areas, the addition of relaxed banquette seating and a large TV screen.